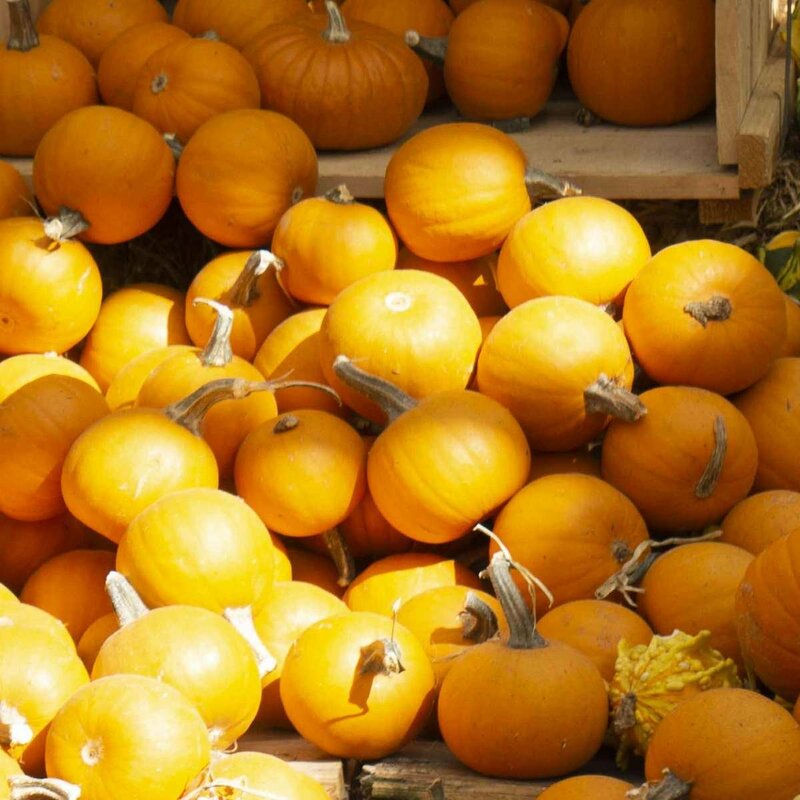 Green Acres Nursery & Supply offers a wide variety of pumpkins perfect for decorating, carving and even eating. 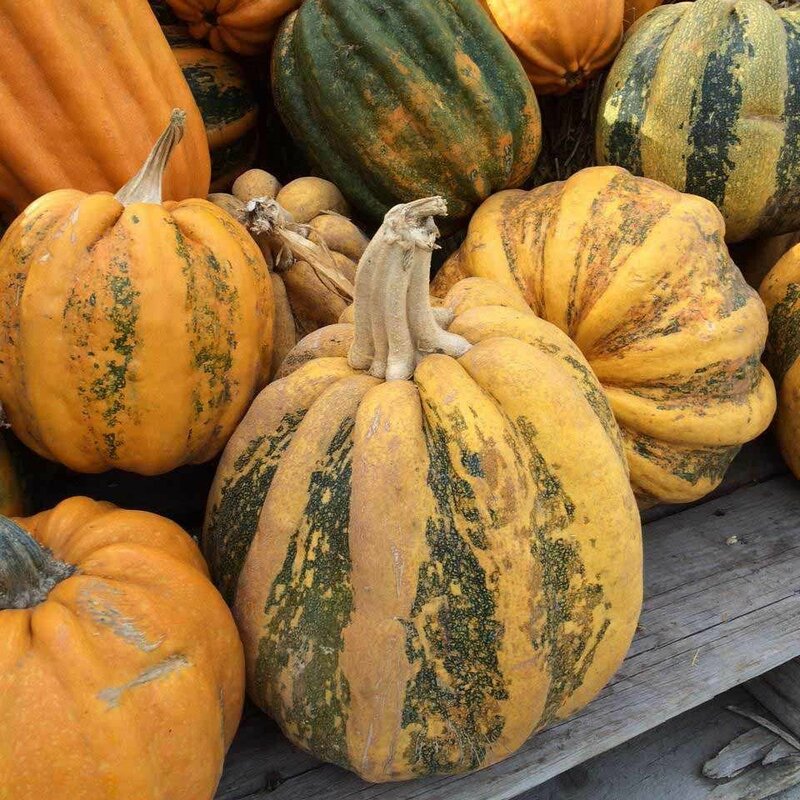 Here is a breakdown of some of our more popular pumpkins, squash and gourds. The following varieties are both beautiful and delicious. 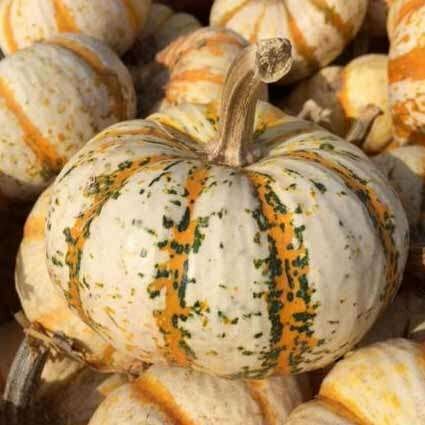 Originally from New Zealand, Kamo Kamo is a medium-small rounded squash with deep ribs and green and orange stripes. Its unusual color variation makes it a festive fall decoration, with a sweet, slightly nutty flavor. Originally known as Musque de Provence, this is an old time favorite from France. It’s deep green when immature, and ages to a fine antique-looking sepia tone. The orange, fine-grained flesh is ideal for baking. Perfectly portioned white-and-orange striped pumpkins, aren’t they cute? Try stuffing and baking them, or using them as decorative bowls for autumn-spiced soup. 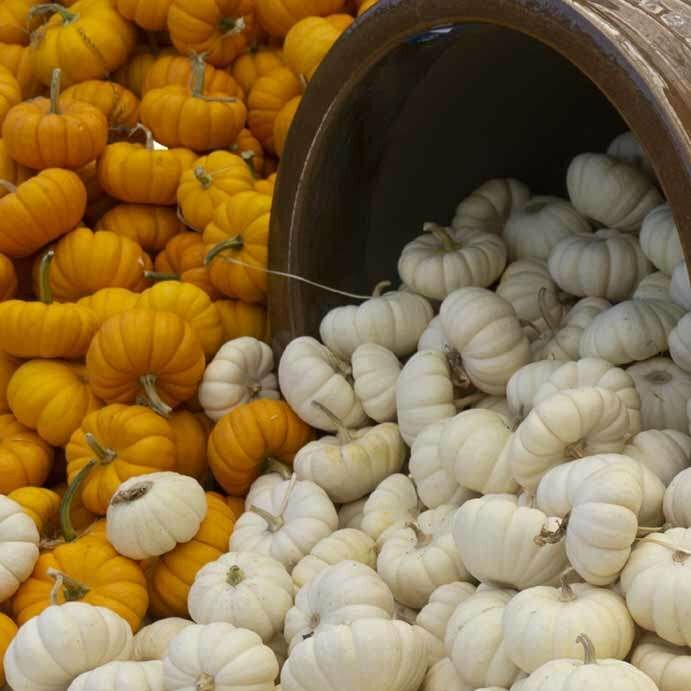 A medium-sized ghostly white pumpkin which delivers a bright orange surprise on the inside. 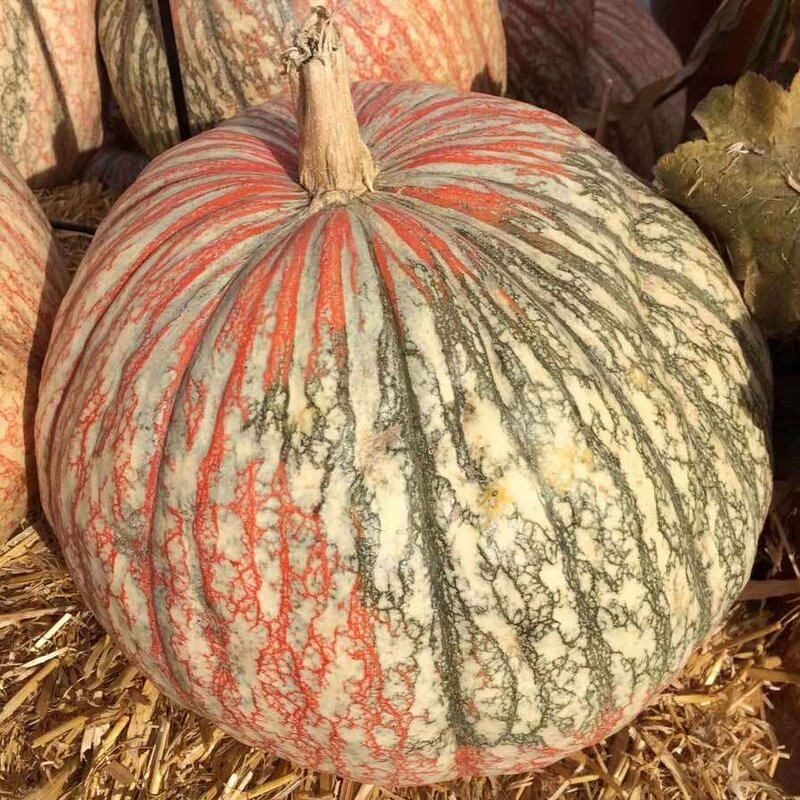 Spooky and delicious, Lumina is tasty for baking and will hold its color for longer if kept out of direct sunlight. The true name of this heirloom variety from France is Rouge vif D’Etampes which is a description of its vivid red coloring. Its nickname is derived from its squat shape, which resembles the pumpkin that Cinderella’s fairy godmother turned into a carriage for her to ride in the night of the ball. 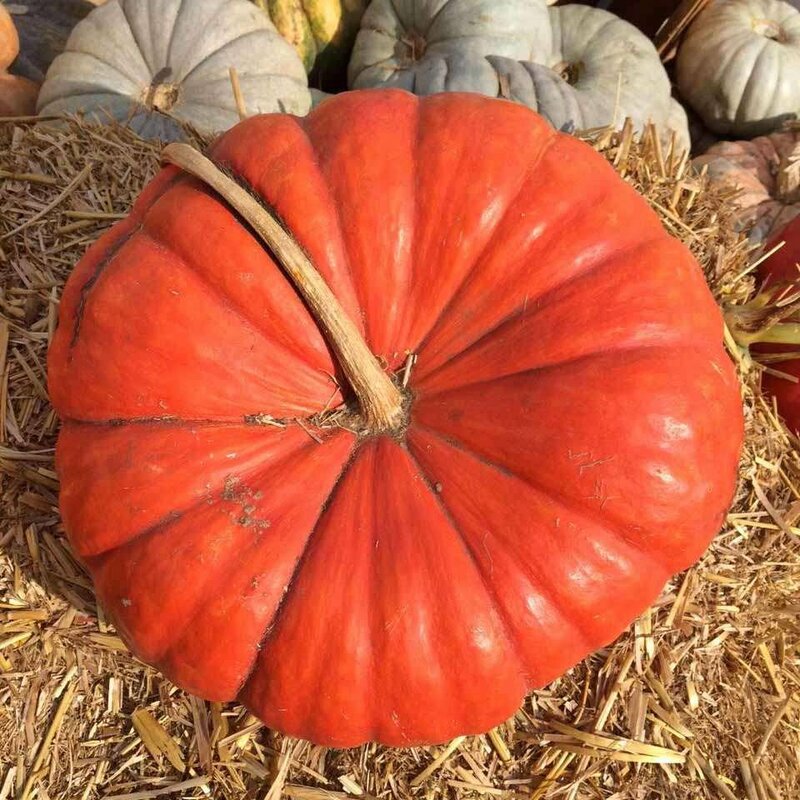 No matter what you call it, this pumpkin is sure to impress as a decoration or baked into a pie. 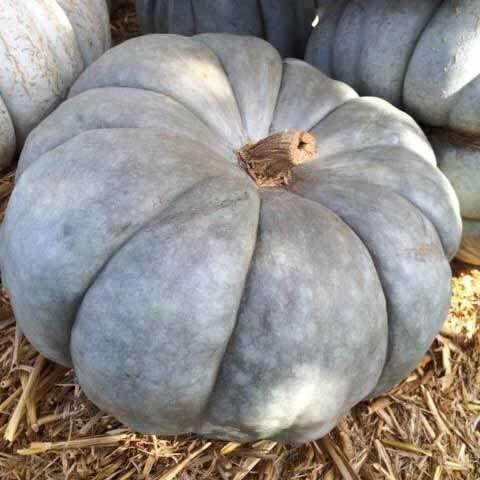 Donning hues in unearthly blues, Jarrahdale is a rare heirloom pumpkin from Australia. Its golden colored flesh is mildly sweet, stringfree and great for baking. 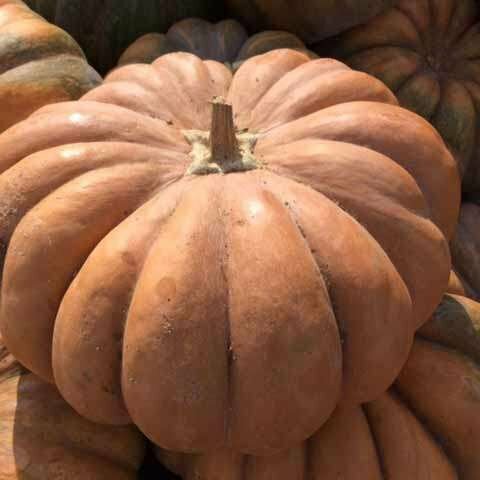 Although most people buy it for its cool color, squatty shape and deep ribs, this is also our most highly recommended pumpkin for pies. The following varieties are notable for painting, carving, decorating or even just using as a festive fall centerpiece. Watch out for this behemoth! 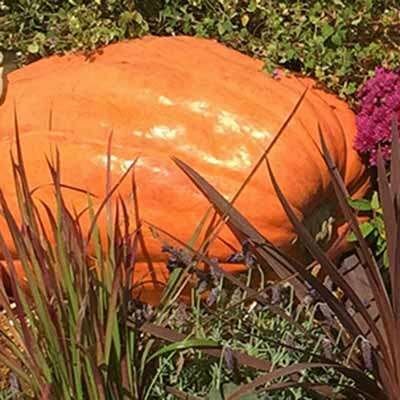 Big Max is a hefty pumpkin which makes a statement with your fall-themed decorations. It has cheerful, bright orange skin and tends to have one flat side from lazing about on the ground. 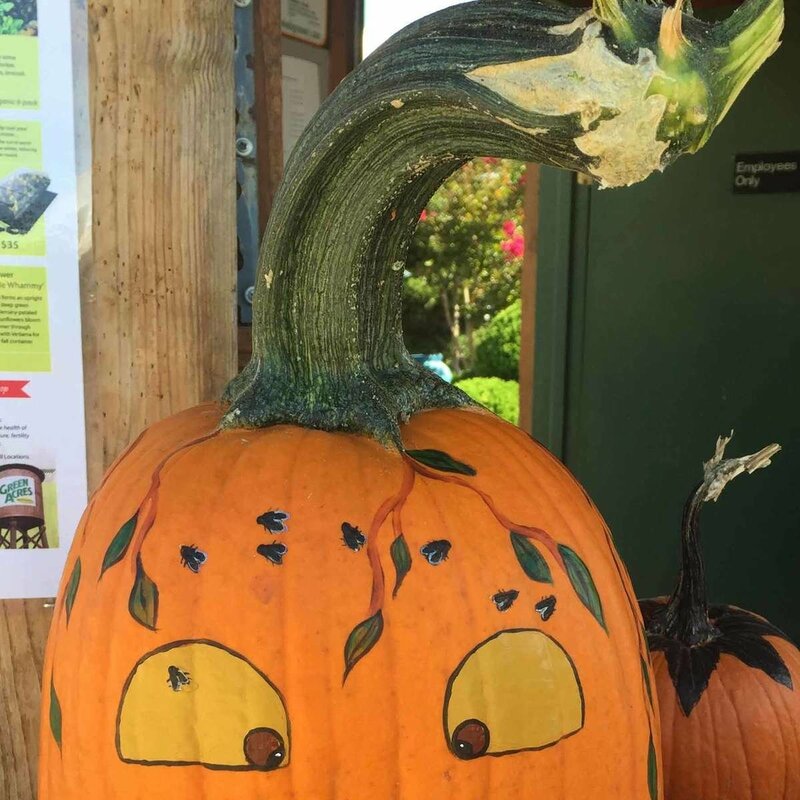 What sets this carving pumpkin apart is its thick stem. 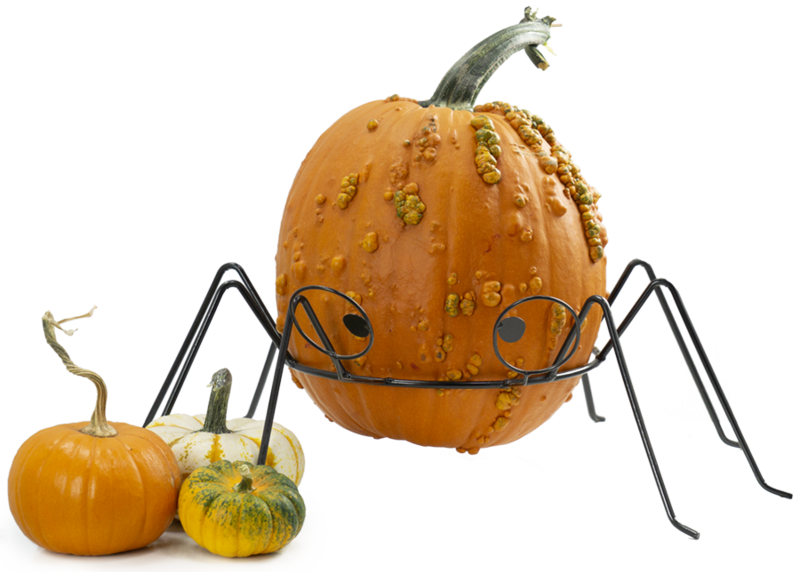 It’s sturdy, long-lasting and adds great character to any jack-o-lantern. This indestructible pumpkin comes in a deceivingly small package. Iron Mans are orange, round, and tough as nails. We like to cut off the stems and use them as bowling balls during our annual Fall Festival. The perfect size for little toddler hands, this mini pumpkin is sure to inspire ‘awww’ in your festive fall display. 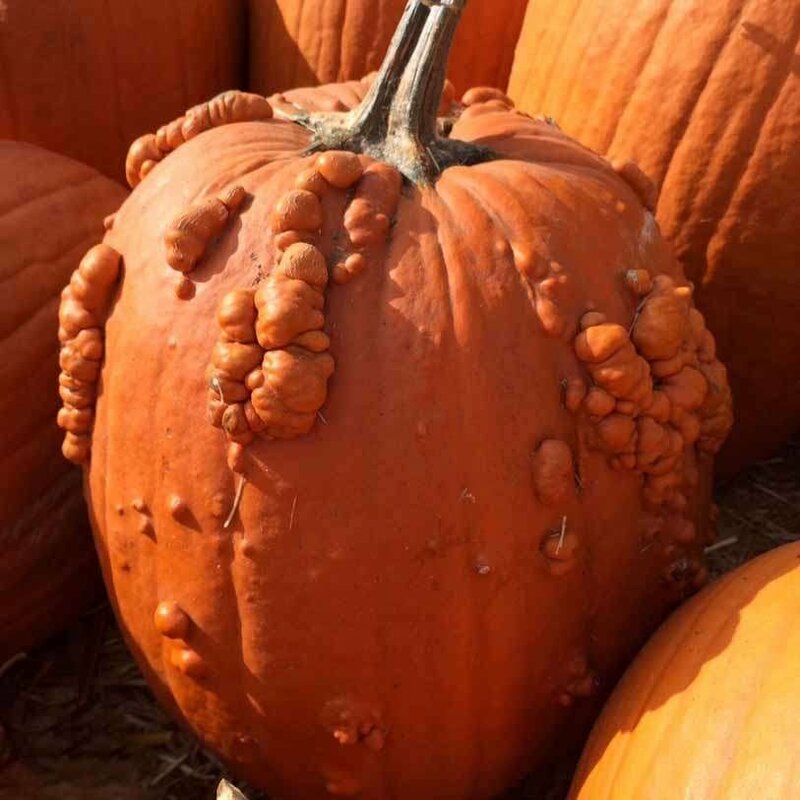 Warty and lovable, this medium-sized carving pumpkin is just begging to be transformed into a grinning witch. Will it be a good witch or a bad witch? Take one home and get creative. This large barrel-shaped variety is swirled with pale pink and cream variegation. 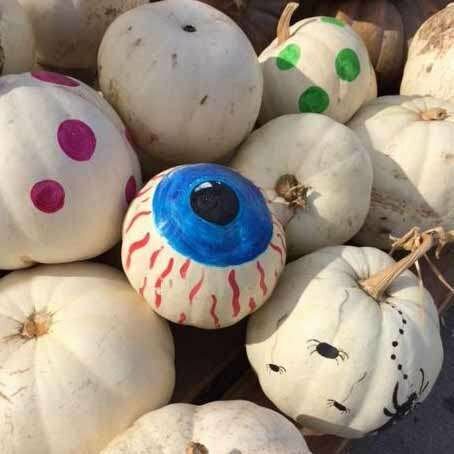 Said to resemble a bloodshot eyeball, its unusual color is sure to turn heads in a spooky Halloween theme. 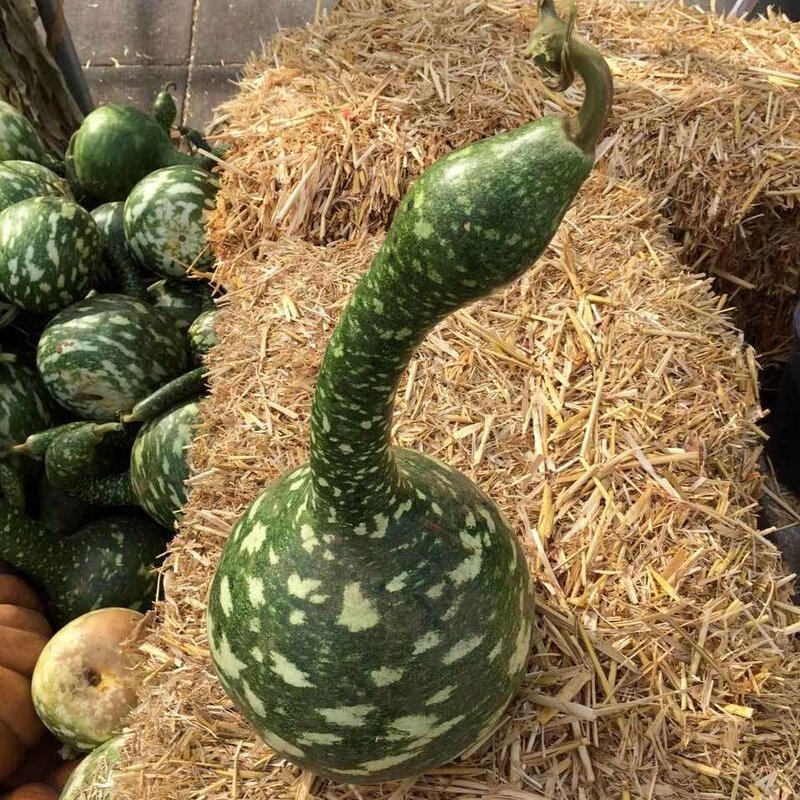 This bright green-and-white striped serpentine gourd is somewhat bulbous at both ends, giving it a sort of avian appearance. Its hard skin makes it extremely long-lasting. It’s a fun gourd to pain or carve when dried. 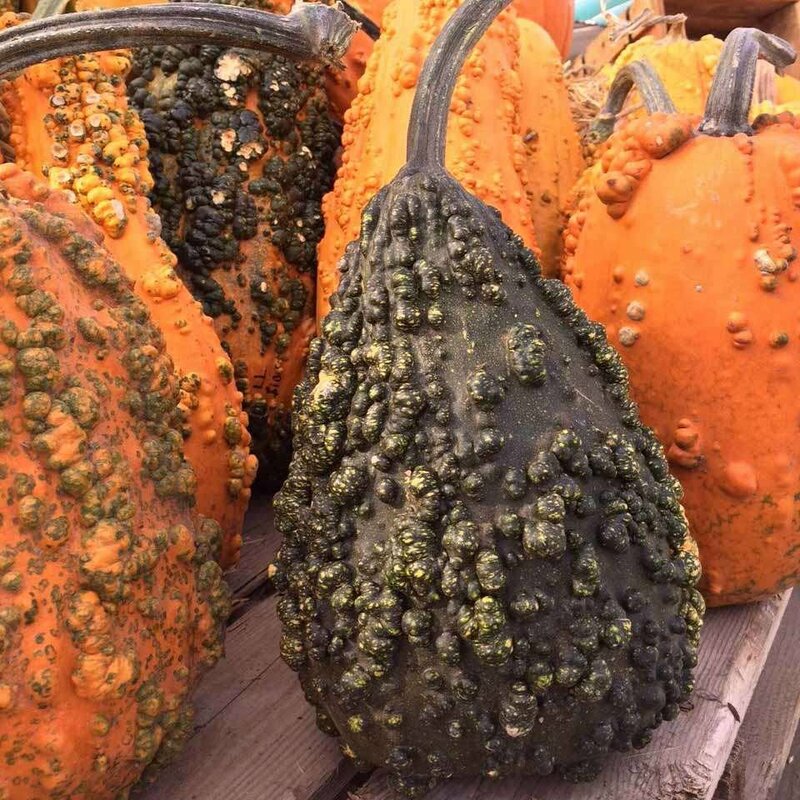 When a couple of little warts just aren’t going to cut it, you need the bumpiest pumpkin we sell: Lunch Lady. The unusual texture and extraordinary color variation makes Lunch Lady a great addition to a Halloween or Thanksgiving display.